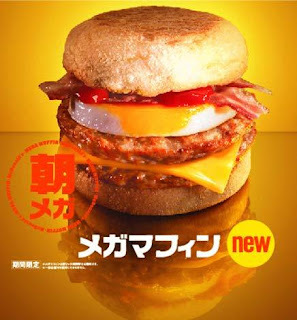 A Rinkya Blog: Mega Muffin From McDonald's Japan! The MegaMuffin debuts next week in Japan on April 4th, and is part of the Mega Morning/Day/Night campaign for Mcdonald's in Japan. Available for a limited time only until May 4th. Made up of 2 pork sausages, 1 egg, bacon, cheese, and ketchup it is sure to give the Mega Mac's calorie amount a challenge, the Mega Mac is a whopping 754 calories and 45.9 grams of fat. Calorie info on the Mega Muffin should be released soon! The Mega Mac that Started it All!